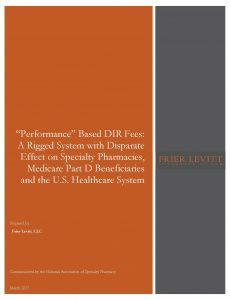 The National Association of Specialty Pharmacy and Frier Levitt, LLC explore the disparate impact that certain Pharmacy Benefit Managers (PBMs) “direct and indirect remuneration” fees (commonly known as “DIR Fees”) have on specialty pharmacies and the healthcare system at large. The investigative white paper, “Performance” Based DIR Fees: A Rigged System with Disparate Effect on Specialty Pharmacies, Medicare Part D Beneficiaries and the U.S. Healthcare System, was commissioned by the National Association of Specialty Pharmacy (“NASP”). It examines how some PBM-imposed DIR Fees, often calculated on a percentage of the total cost of the medication, have had a disparate impact on specialty pharmacies that focus on dispensing complex and high cost medications, that often require additional clinical and patient services.